Do you love freelance billing? I’ve already blogged my love for Freshbooks once this year and here I go again. But this relationship is going far deeper than my initial rushing crush. First, for those of you not in the know, Freshbooks is online invoicing, time tracking and billing software favored by creative types and future Internet moguls. Not something you would ordinarily find yourself getting excited about. Not in a million years. Until you start freelancing for a living without a lick of business sense and have a painful late-90′s method of managing invoices. Then you get interested, quickly. 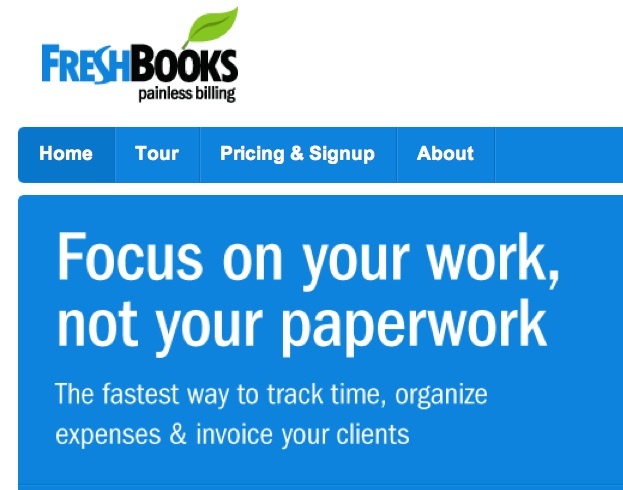 Painless billing is what Freshbooks aims to offer and boy do they. They deliver economic salvation in an easy-to-use manner that’s not so simple you feel like a moron. Plus, they deliver it with a refreshing wit and clarity that I admire. So if invoicing and financials are painful for you as a freelancer, check them out. I am grateful for Freshbooks every day. Especially billing days. So what else sets them apart? They like their customers and they know what they do. They like to help their customers do more of what they do. Freshbookers can enjoy informal gatherings where they can get to know the company folks and get to know others like themselves in the community. I had breakfast this weekend with a crew of Freshbookers organized by John Coates and made some valuable connections and met some truly interesting folks. Bloggers. Web developers. Designers. Web designers. Company owners. A great mix. The conversations were invigorating, insightful and inspiring both creatively and personally. All that thanks to my invoicing software. I would never have expected so much from them, but I guess I should have known. Freshbooks the software absolutely rocks. Freshbooks the company is equally spot-on.